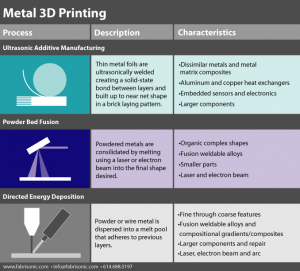 Powder Bed Fusion (PBF) is the ASTM standard name for 3D printing techniques based on a powder bed (DMLS, EBM, DLM, and SLM). PBF is by far the most popular metal 3D printing process, due to its longevity in the industry and versatility. However, there are commercially available 3D processes that do not use powders. 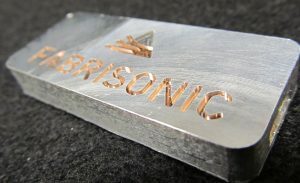 One such process, Ultrasonic Additive Manufacturing (UAM), leverages commercially available metal foils. ASTM identifies this style of 3D printing as ‘sheet lamination’. As we will see below, there are fundamental differences between PBF and UAM that make each suited to different manufacturing needs. -PBF has been used with many common engineering metals. In order to print consistent PBF parts, it is essential for the feedstock powders to have a specific particle size, shape distribution and metallurgical purity. A supply chain for these materials is developing, but the understanding of the complex interactions between all of the powder parameters will take years of research. Interested in discussing if UAM is a better alternative for printing your parts. Click here to get started with Fabrisonic!